Are you stuck up in removing your computer CMOS or BIOS password, even after trying all possible password which you have imagined are you still unable to remove the password from your Computer bios. 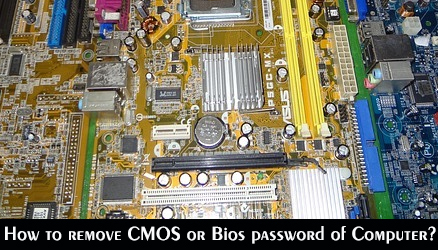 If yes than we have a quick solution on how to remove BIOS password of your Computer. Shutdown the computer, unplug it. Take a screw driver and open one side of the computer compartment, from which you are able to see the motherboard of the computer. After successfully opening the one side of the compartment shield you will able to see the motherboard, than just locate the small battery on your motherboard. Just remove the battery from the slot on the motherboard, and wait for few seconds and re-install the battery and assemble the computer back. Plug the computer and turn it on and then your try to go to the CMOS or bios settings, you will be easily get entered into BIOS menu without asking for any password. So you have successfully finished removing the password from your CMOS or BIOS of your Computer.